The Carpenter's Ministry Toolbox: SERVICE: It's the season of SOCKS!! Imagine how hard it would be to go through the winter with feet that were constantly cold or wet because you had no socks. Most of the U.S. is now in the season of cold and wet. Homeless shelters around the country are in dire need of socks. They don't have to be new or even match, but they do need to be clean and in good shape. Holes don't cover soles! At the same time, if you haven't yet, make a connection and build a servant relationship with the shelter in your area. 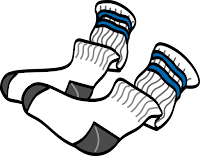 Every city in the country has a homeless shelter where socks or all sizes are needed. One of my youth director friends told me a young lady visited her church and she couldn't find any socks for her. The best she could provide were plastic bags. Think of how you would feel if your children had to go through the winter with plastic bags for socks. If you work in a church, bring some socks in and leave a couple pair in every office just in case somebody comes in who needs them. If you're in the Minneapolis area there's an organization called SoleCare for Souls. Their mission is to promote health and hope by providing free medical foot care for people experiencing homelessness or living in under-resourced conditions. If your congregation is in the Minneapolis area and you're looking for a service project for your children or youth, try supporting them. If you're not in the Minneapolis area, see if there's a similar organization near you. Help warm souls by warming soles!